The Spanish Grand Prix was the first race on the European continent for what was been an unpredictable 2012 Formula 1 season. In four races opening the tour, four different drivers with four different teams owned a victory. Entering competition at the 4.655-kilometer Circuit de Catalunya, there stood a very good chance that the 2012 season could see a fifth unique driver/car combination racing the event. 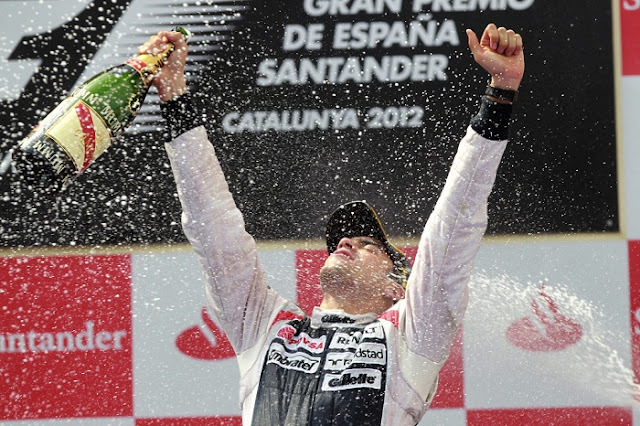 Since 2006, there is no driver with more than a single Spanish Grand Prix win. Secondly, the qualifying exclusion of the time posted by Lewis Hamilton's McLaren-Mercedes, the young Venezuelan driver Pastor Maldonado was promoted to pole in his Williams-Renault race car. Contrary to weather forecasts yesterday calling for rain, the Spanish Grand Prix transpired under dry conditions. Starting alongside the Ferrari of Fernando Alonso, the sophomore Formula 1 driver Pastor Maldonado front row start went according to the best case scenario. In the second row, the Lotus Racing F1 cars swapped positions as the experienced pilot Kimi Raikkonen flew past teammate Romain Grosjean in a tight battle through the first corner. Dropped to the back of the racing grid because the inability for McLaren to provide a fuel sample after qualifying Saturday from an empty fuel tank, the Spanish Grand Prix's would-be polesitter Lewis Hamilton had to make up considerable ground through the 66-lap event. In the first lap, the McLaren-Mercedes of Hamilton had climbed to 19th place. Passing car-after-car through the course of the grand prix, Hamilton would take the 8th spot in the final results besting McLaren teammate Jenson Button. In the 12th lap, a battle between Michael Schumacher and Bruno Senna would result the DNF for both drivers. Through the Circuit de Cataunya's DRS zone through the frontstretch, Schumacher's Mercedes GP car rammed the back of Senna's Williams-Renault. After the German driver's retirement, Schumacher responded to the incident saying, "It is not easy to see from the TV replays but what happened from my viewpoint was that he went to the right to defend the inside line, and then suddenly, shortly before the braking point, went to the left. When you are so tight together in the braking zone, you have no other choice than to try to react and avoid hitting but it was too late." Formula 1 stewards taking a look at collision concluded that the Mercedes GP car was at fault and will be assessing a five-grid position penalty to Michael Schumacher for the next race in Monaco. "It has been a disappointing weekend for me on the whole. It was difficult to overtake at the beginning of the race and then Schumacher got a big DRS boost coming down the straight and went into the back of me." said Senna who would sit out of a race where his Williams F1 teammate was taking advantage of a career-making moment. 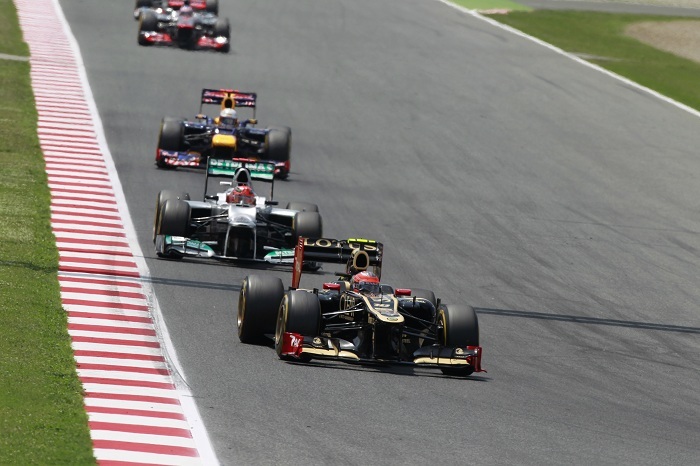 Throughout the Spanish Grand Prix, Pastor Maldonado drove a near flawless event. Early on, the Williams-Renault fended off the two-time Spaniard Alonso who one was racing with spirit of a home crowd behind him. Though Maldonado would not run away from the determined Ferrari, the combined efforts of the 18 car driver and the Williams F1 Team pit crew held Fernando Alonso and the rest of the Formula 1 competitors at bay. 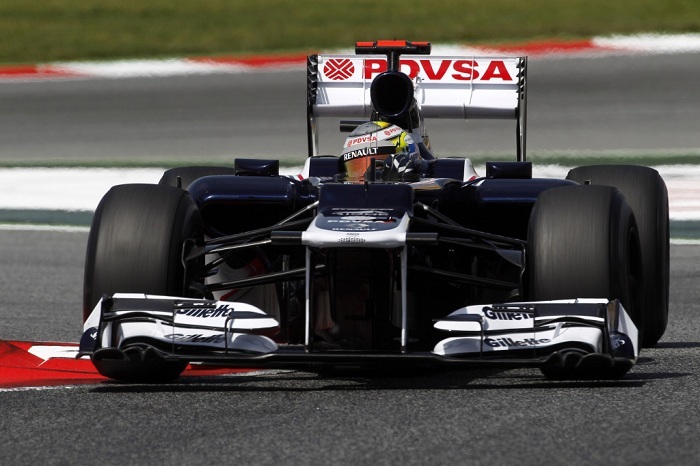 At the checkered flag, it is Pastor Maldonado who brought his Williams-Renault to a fantastic victory. The first Formula 1 victory for the 27-year old Maldonado, the Williams F1 Team pilot becomes Venezuela's first grand prix winner. It’s an unbelievable feeling winning my first race. The car felt really consistent, was fantastic to drive and our pace was strong throughout. Alonso was chasing me hard but we looked after our tyres well and I managed to open the gap towards the end." said Pastor Maldonado becoming the second first-time grand prix victor in addition to Nico Rosberg this season. For the Williams team, the win in Spain ends a dry spout resulting after the 2004 Brazilian Grand Prix where Juan Pablo Montoya wheeled a BMW-powered machine across the line first. As team owner Frank Williams reestablished their relationship with Renault in this season, the grand prix win in Spain also becomes the first time the constructor and engine combination went to victory since Jacques Villeneuve's Luxembourg Grand Prix win in 1997. While the streak continues into the 2012 Formula 1 season for different drivers and construction prevailing in grand prix races, Renault ties Mercedes-Benz with two wins as an powerplant provider so far this season. In second, Fernando Alonso scored some valuable runner-up points that allows him to tie Sebastian Vettel at the top of the driver's championship leaderboard after five races. Vettel brought his Red Bull-Renault across the line 6th after starting 7th in the Spanish Grand Prix event. Leaving the Bahrain Grand Prix with a double-podium finish, Lotus F1 Racing followed up the effort at the Circuit de Catalunya. Chasing Fernando Alonso closely in the closing laps, Kimi Kaikkonen settled into third place. 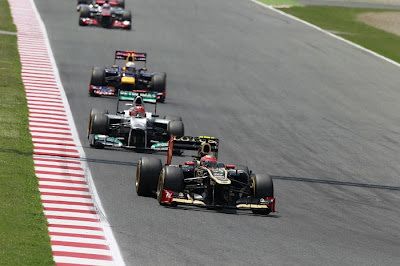 Romain Grosjean steered his Lotus-Renault machine around the course for a fourth place spot at the end of 66 laps. Behind the Lotus F1 Racing pair was the Sauber-Ferrari of Kamui Kobayashi rounding out the top-5 for the 2012 Spanish Grand Prix. Following the race, celebration in the Williams F1 Team was marred by a fire. Within the garage stall where Bruno Senna's race car sat, a sizable fire believed to be started around the fuel area resulted in several crew members from the Williams as well as the neighbouring Caterham garage to be put in harm's way. While the flames were bought under control quickly, numerous team personnel from both teams required medical care. Details on injuries and the cause of the fire is still sketchy. More details should come out on the incident when an investigation will be concluded. The May 27th Monaco Grand Prix will be the next race on the 2012 Formula 1 schedule.